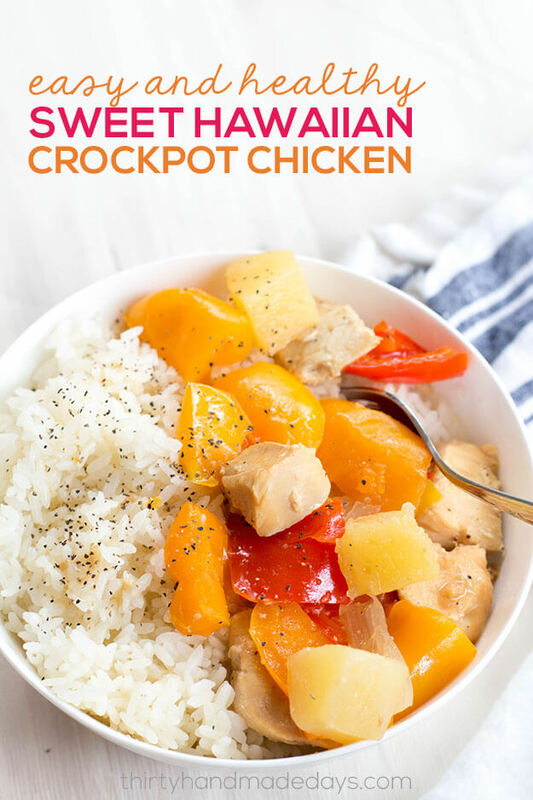 I’m so excited to share this new recipe for Sweet Hawaiian Crockpot Chicken. It’s healthy, delicious, and so easy to make! 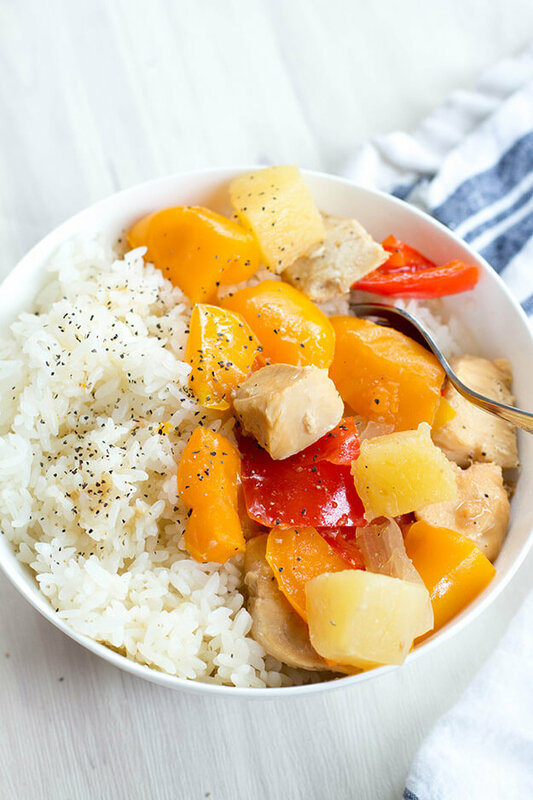 What’s so great about this recipe for Sweet Hawaiian Crockpot Chicken? It’s naturally sweetened with a cup of apple juice. That means you only need to add a bit of brown sugar AND it has enough liquid to be cooked in an Instant Pot. It can be cooked fresh or frozen (raw) and cooked later. I love that this recipe is so simple. I’m busy with four little kids (and a fifth on the way! ), so having dinner waiting in my crockpot is a big relief at the end of the day. Is anyone else a fan of easy and healthy crockpot recipes? I shared my favorite recipes for crockpot chicken teriyaki and crockpot honey garlic chicken earlier this year, and there are hundreds of other options on my New Leaf Wellness blog. 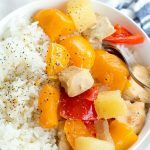 A lot of sweet Hawaiian crockpot chicken recipes are made with soy sauce, but I think that only takes away from the sweetness. I like to omit it altogether. Give it a try my way – you can always add some soy sauce on top when serving if you think it needs it. I like to serve this sweet Hawaiian chicken over rice (made in my programmable rice cooker, of course). Super easy and yummy. 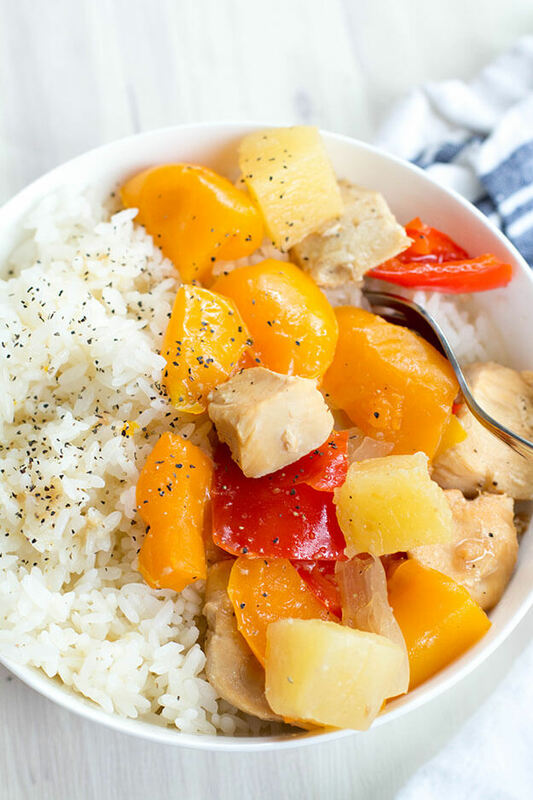 You're going to love this new recipe for Sweet Hawaiian Crockpot Chicken. It’s healthy, delicious, and so easy to make! Add all ingredients to crockpot and cook on “low” setting for 4-6 hours. ** To cook in an Instant Pot, add all ingredients and pressure cook for 8 minutes. Quick release. ** This recipe can be frozen without any cooking ahead of time. Add all ingredients, except pineapple, to a gallon-sized plastic freezer bag and freeze for up to three months. When ready to cook, thaw and follow cooking directions above. Do you have an ebook that has all of you make ahead crock pot meals in it? There are a TON of crockpot freezer meals in my cookbook eBooks, but they are mostly exclusive recipes. That means they appear in the books and no where else – definitely my best recipes though!